The proposal is based on an insightful identification of the existing characteristics and conditions offered by the site. It includes elements such as a busy traffic corridor, a dormant island suburb, architecturally and historically significant buildings, a 100-year-old copse of pine trees and a quiet bay. The urban fabric is based on making good use of these elements and their perimeter interfaces. The overall plan places a terraced block at the north end of the boulevard, with its highest point serving as a landmark on entry to Laajasalo. The relationship between the low-rise section and the surrounding terraced houses could be more subtle than suggested by the basic concept and more consistent with the environmental scale. The pace of the elongated masses in the north changes as you reach the bay. The high-rise buildings erected on a low pedestal give the boulevard a relaxed, natural rhythm. A distinct and original block is created between the bay and the boulevard, which serves as a clear node linking the services to the west of the boulevard to the bay in the east. The new nucleus has been nicely accentuated by making a small twist in the boulevard. The concept is extremely elegant. By a simple and natural gesture, the elongated street space is converted into a series of curved, more low-scaled spaces. The proposed artificial island is a bold way of preserving the waterfront. However, it is unnecessarily extensive with a low plot ratio, considering its size. The island offers potential for unique housing. The marina between the boulevard and the bay ends beautifully in the sea. The communal activities at ground level to the south of the pedestrian street and the covered market have been successfully executed in a way that contributes to the seaside atmosphere. Moreover, the overall plan is workable also in terms of traffic. The compact blocks do not require an extensive road network. The design solutions – such as the preference given to cycling and walking or the details proposed for the boulevard – can be gleaned from the individual areas addressed in the plan. However, a clear and more comprehensive presentation could have been provided. Similarly, parking is addressed only in passing. Some of the parking decks appear under-dimensioned considering the size of the blocks. The traffic and parking solution proposed for the artificial island calls for further study. The block plans deserve credit for the distribution of masses and ease of approach rather than for faultless details. The types of buildings proposed are suitable but require further analysis, particularly in terms of the noise and emissions generated by the boulevard. Too many flats only have windows facing the boulevard or are placed along the fairly low-ratio stairwells. However, the types of buildings proposed offer true potential. A narrow lamella design can also be harnessed by opting for units with a double view. In the wedge-shaped sections facing away from the boulevard, the overall design concept blocks noise while opening views in two directions for the corner flats. The plan to place parking facilities partly under the building frame is feasible and supports the narrow block model. However, it will be costly if executed as proposed. The upper structures could also have been taken into account in the diagrammatic analysis. 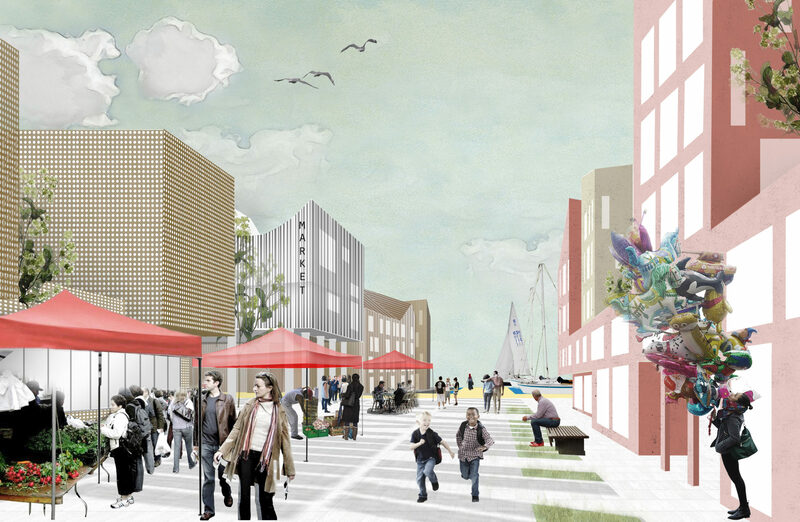 The proposal is one of the best entries in striking an equilibrium between the type of boulevard, the natural assets, the nucleus of the new local centre and the link to the sea. The most important public space is placed exactly in the right location, like an acupuncture needle. The subtle twist in the boulevard offers a magnificent view of the sea at the point where the tramline turns towards the western part of the island. The pine-covered hill left in its natural state opens delicately towards the central plaza between the narrow lines of buildings. The design spares part of the old pine woods while leaving enough breathing room for the existing valuable lamella houses. At the southern end of the boulevard, the long wall of buildings is cut off intermittently to allow verdant green areas to extend to the boulevard in-between the residential buildings. The meeting between nature and a city built of stone involves high drama. 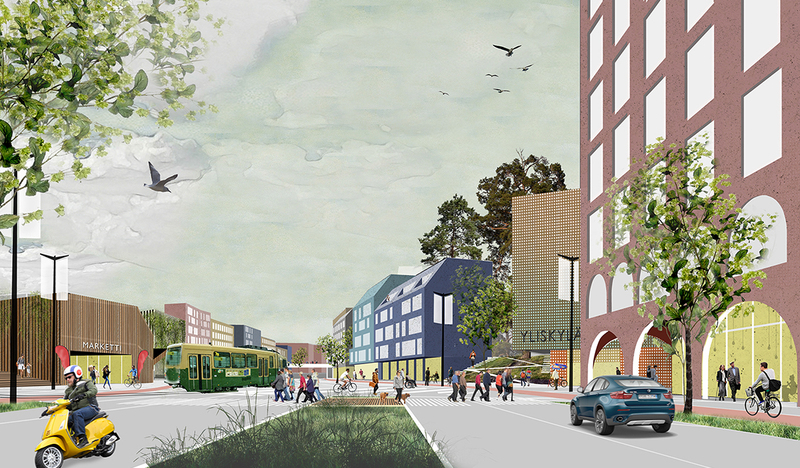 It could be developed further into an even stronger unique feature of the area – with due regard to noise and particle emissions – that would make the Laajasalo boulevard stand out among the other access corridors being designed for Helsinki. At the periphery of Helsinki city lies Laajasalonlahti:a sheltered bay where a 100 year-old pine forest gradually descends a slight slope before being met with the wetland rushes of the waters edge. On the eastern side of this ecologically significant site lies Laajasalontie: a car-dominated highway dividing Yliskylä town centre and suburbs in the east from the recreation opportunities of the western Laajasalonlahti. In the wake of new urban zoning schemes, including an urban boulevard and new proposed pedestrian and tram connections to Helsinki city centre, Laajasalontie has the opportunity to transform itself into a lively and distinctive urban boulevard. 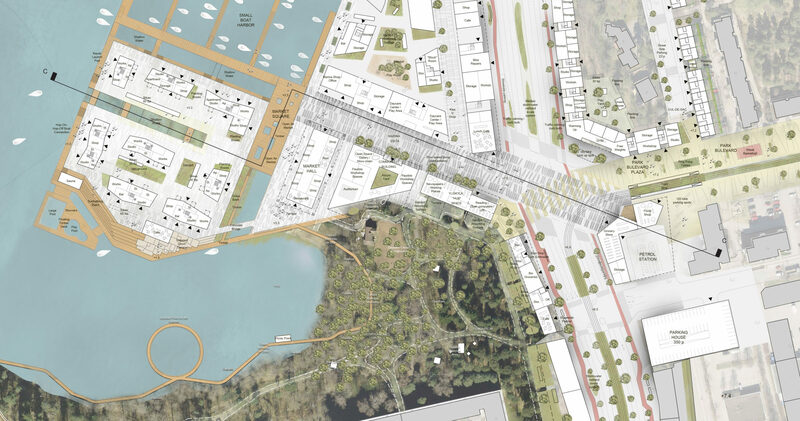 At the heart of this urban transformation, this scheme proposes two new harbourside precincts – Laajasalo Harbour Island and Marina Village which maximise density while conserving as much of Yliskylänlahti grove and the wetland environment as possible. 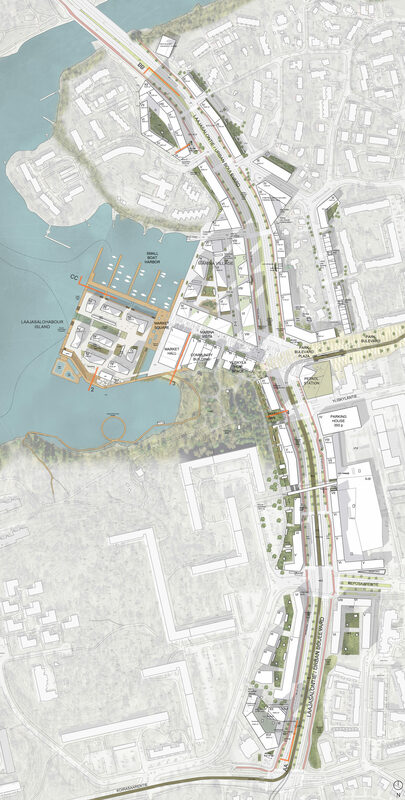 This new harbourside development area seeks to increase connectivity between the town centre in the east with the harbour in the west by proposing two new connection axes. The first axis – Marina Vista Lane – acts an extension of the existing pier, connecting the new marina with proposed tram stop and plaza on the eastern side of the boulevard. The second axis – Park Boulevard – proposes an East–West ecological ‘green’ corridor connecting Reposalmi in the east with Yliskylänlahti forest in the west. New proposed mixed-use development along the Laajasalontie Boulevard extend from the intersection of these axes. Along these axes, a series of key public spaces are proposed. 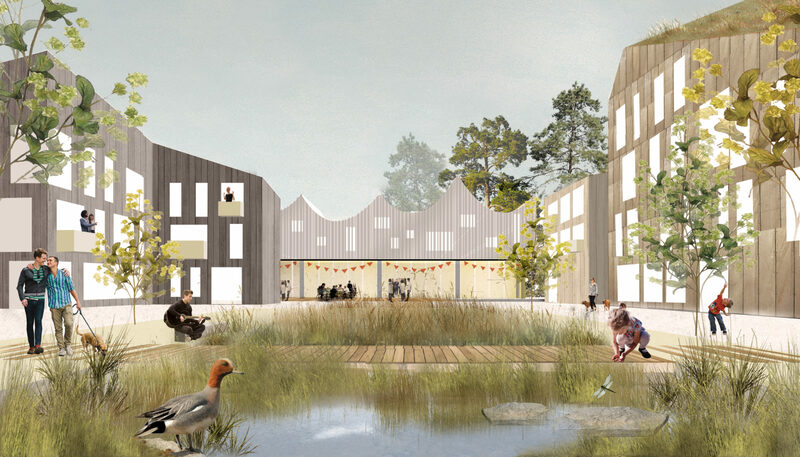 Through mixing both public and private functions, including productive living, working and playing spaces, this project envisages an active rejuvenated urban environment for Laajasalo. In ecology – the ’ecotone’ or edge between two different environments is the most diverse, active part of an ecosystem. In this project, we apply the ‘ecotone’ concept to the urban landscape:the threshold between two different conditions. 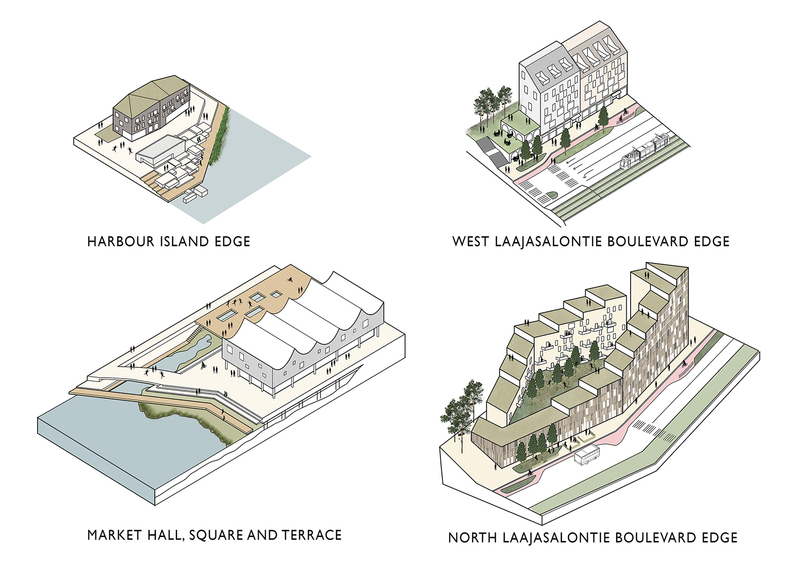 At a large scale, we consider the transition from town centre towards the harbour;at a smaller scale, the edge condition between waterfront building and sea, between community buildings and forest, or between boulevard facades and the street. Focus is placed on creating dynamic edge conditions concerning the waterfront,street terraces and forest views, with emphasis on accessibility to urban recreation spaces for all. Mielenkiintoinen ehdotus. Arveluttaa tuo satama-altaan laaja rakentaminen. Rantametsää olisi voinut jättää enemmän paikoilleen myös. Metsäkaupungin tai puistokaupungin idea ei tosin ole kovinkaan kestävä kaavottajan ajatusmalleissa. Asukkaat niissä kyllä viihtyvät ja voivat hyvin.